Please note this only impacts UK users registered under the Flat Rate Scheme (FRS). April 2017 is the first reporting month effected by the recent changes to the FRS scheme. The VAT Report has been enhanced to warn users that they might need to calculate their VAT result with the Limited Cost Trader Rate of 16.5% instead of the industry rate they are registered under. There is a link to the HMRC calculator set up specifically to help you make the determination. If necessary, users can select the option to recalculate the report using the 16.5% rate (or 15.5% rate if you are in your first year of registration). 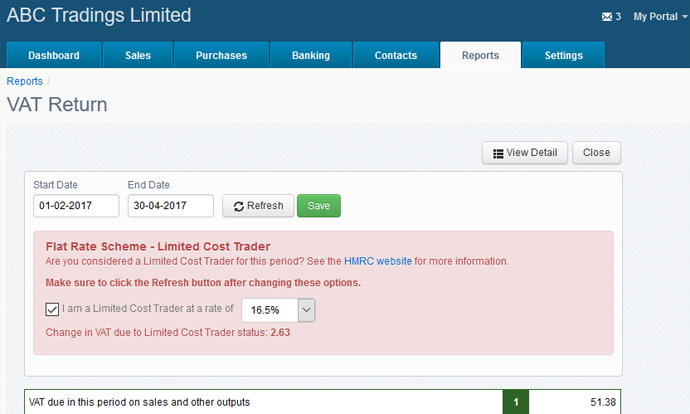 Saving the report will generate a journal entry to adjust the VAT Control account and recognise the impact of reporting VAT for the period as a Limited Cost Trader.